For more than a decade, consumers have been ditching the disposable mindset for products in the marketplace with permanence and sustainability. This change in consumer values forced companies to take a long hard look at their environmental impact. The word “sustainable” became a marketing buzzword used loosely to mean “green.” Today, many companies prioritize their carbon footprint and are going next level by creating zero waste production methods and circular economies. To understand the concept of a “circular economy,” let’s look at the restaurant industry where the average restaurant produces over a ton of waste every week. 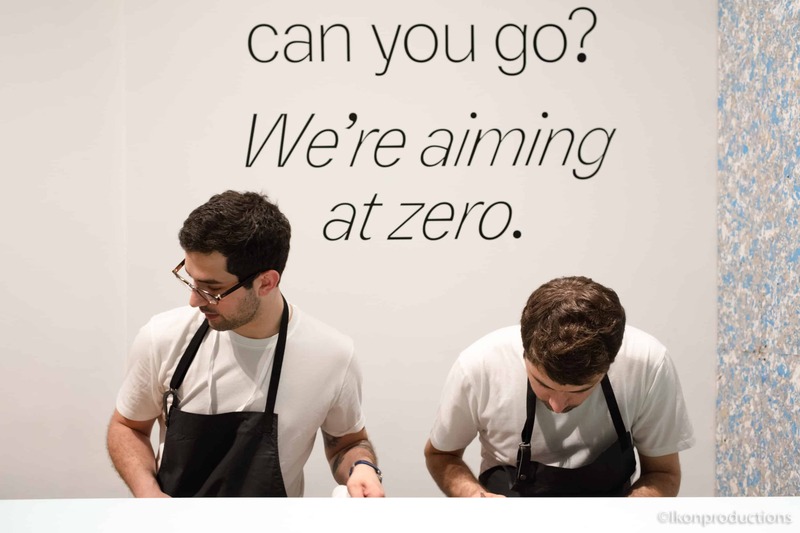 As a solution to all of this restaurant refuse, a group of innovative chefs from Helsinki created The Zero Waste Bistro, a dining experience installation at NYCxDESIGN. At the Zero Waste Bistro, chefs from Nolla, the first Nordic zero-waste restaurant in Helsinki, present food that is sourced, packaged and produced to create zero waste. Zero Waste Bistro explores the themes of circular economy, new material innovations and sustainable design. Presented by the Finnish Cultural Institute in New York and co-curated by Finnish designers Harri Koskinen and Linda Bergroth. It introduces the food philosophy of Helsinki-based Restaurant Nolla, the first zero-waste restaurant in the Nordic region. 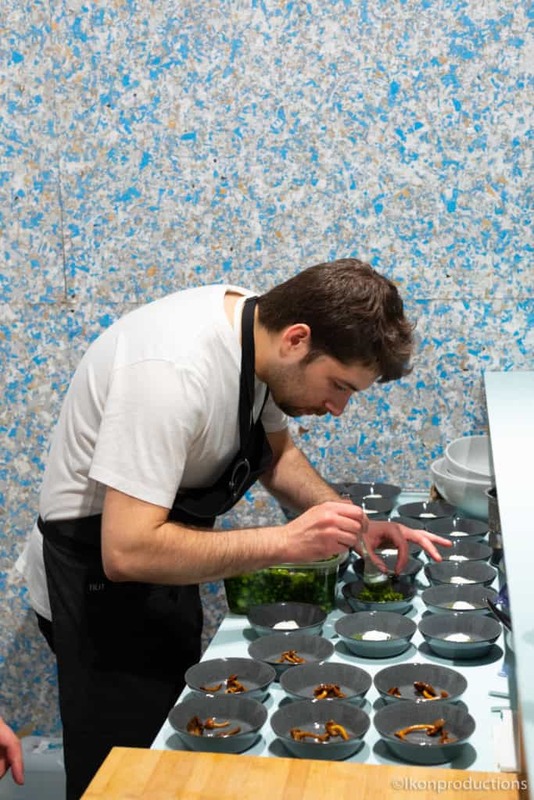 Chefs Luka Balac, Carlos Henriques and Albert Franch Sunyer are working to make the restaurant industry healthier for the planet with a zero-waste model. This circular economy follows the philosophy of refusing, reducing, reusing and (only as the last resource) recycling . “It’s time to rethink the way we live, the way we eat and the materials we use. Our seas are filled with plastic waste. In the US alone, over 58 billion disposable cups are discarded and sent to landfills every year. What if all of those cups were reusable, compostable or recyclable? What if our everyday packaging was made of plastic-free materials, reducing plastic pollution and toxic microplastics in our soil and water supply. What if we collectively committed to only buying products that we love and that will last a lifetime? These are the questions we need to ask ourselves as a society. 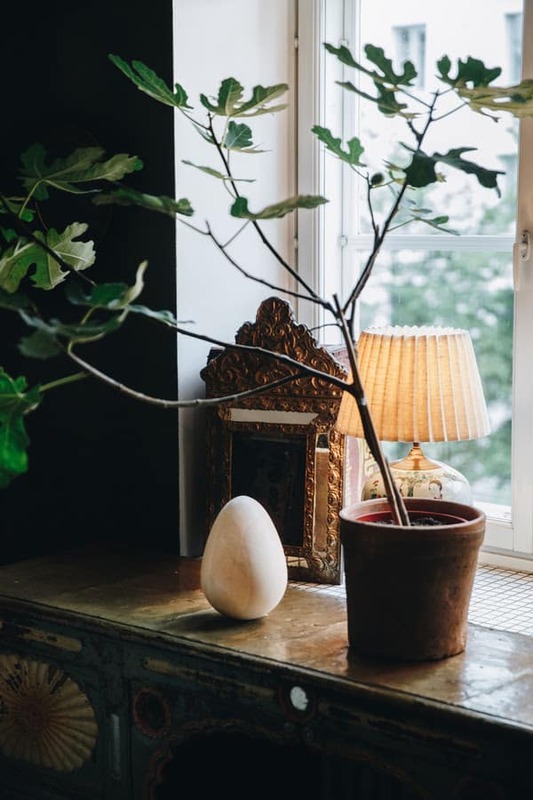 With Zero Waste Bistro, we’re proposing a future that reduces waste and helps to regenerate our natural environment, making it livable for generations to come; a future that’s already here if we make the right choices,” says Kaarina Gould, Executive Director of the Finnish Cultural Institute. 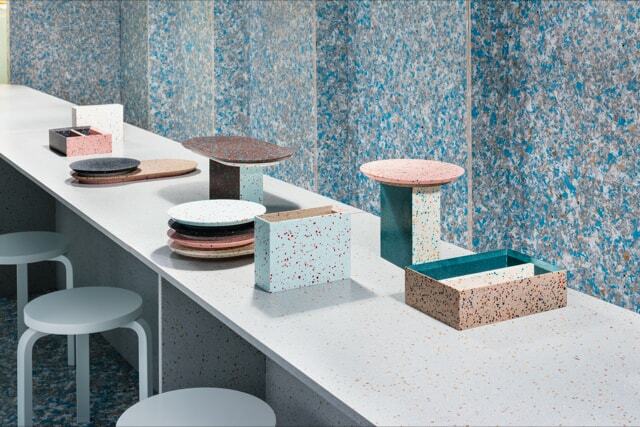 The Zero Waste Bistro is constructed of Durat surfaces, sustainable solid surface material which contains recycled plastic and is 100% recyclable. Materials literally become a part of us just by passively living with them. It’s a scientific fact that the items we live with shed and emit into the atmosphere, the built environment and we absorbing these small particles. Paints, varnishes, particle board, plastics, carpet— there are numerous substances in the common household that slowly release toxins that end up in our bloodstream. This underscores the importance of well-made design using healthy materials that are good for us and the environment. Lapitec, a “sintered stone” is one example of healthy surface cladding that goes beyond its performance by embracing sustainability and stewardship. Lapitec designed a product that incorporates technology to help clean the air with its proprietary Bio-Care technology “baked” into the slab that breaks down pollution. Lapitec reacts with UV light to break down pollution. 100 square meters of Lapitec can break down the equivalent CO2 of 28 trees. Launched in Europe, many of these sintered stone manufacturers build sustainability into their brands through the manufacturing, recycling and reclamation processes. Companies that advance both conservation and business objectives not only reduce their carbon footprint but make a “handprint” by protecting and fostering mother nature. New England lumber mill, Hull Forest Products, permanently protects over 13,000 acres of forestland through the family land trust, Hull Forestlands L.P. The company removed the possibility of development to ensure that its working forests will remain a source of timber for generations to come. “Wood flooring that hails from well-managed forests is a great way to bring a sustainable material into your home. 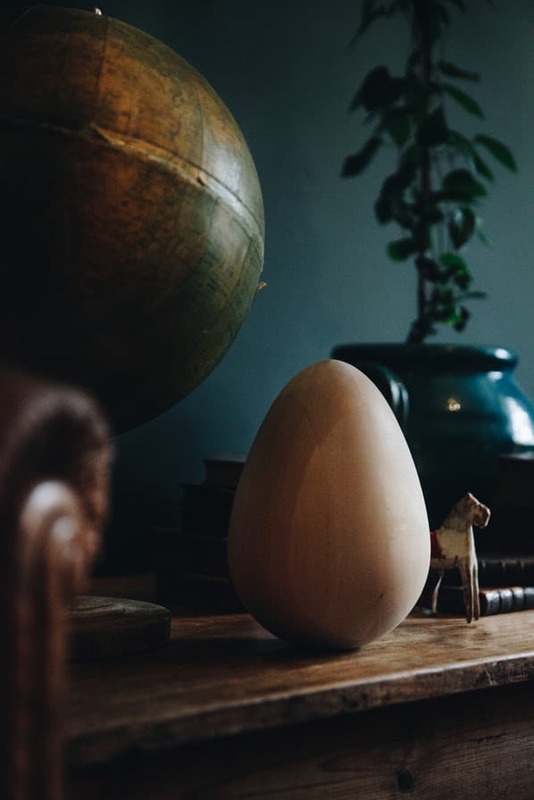 Not only does wood contain less embodied energy than any other floor covering, it’s also good for your home’s indoor air quality. Solid wood floors also have an exceptionally long service life, and they sequester carbon. While our working forests are growing the timber that we use to make our wood flooring, they are also providing wildlife habitat and other important ecological services,” says Hull Forest Products. 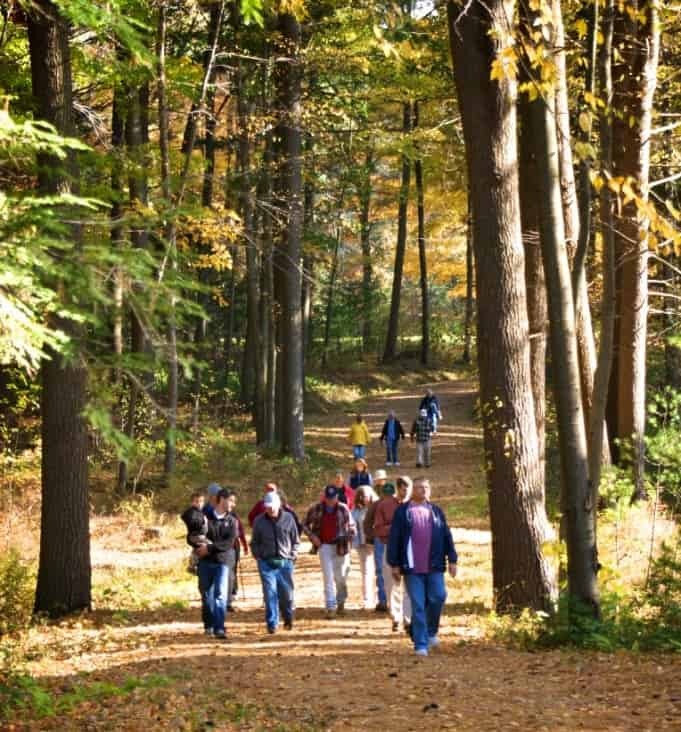 Hull Forest Products invites the public on wood walks to learn about sustainable forestry. 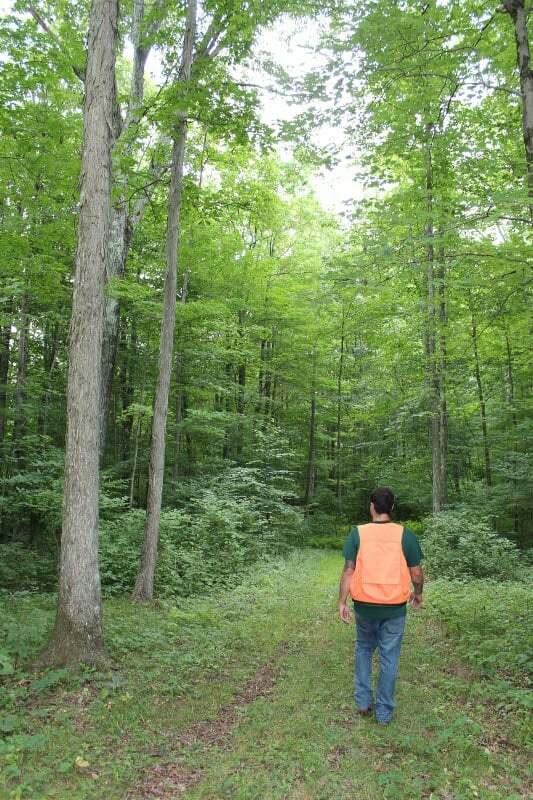 Participants can walk recreational trails created during a 2017 timber harvest and observe enhanced wildlife habitat. Net positive means to give more than you take. Net positive products give more back to nature and society than they take. Companies that make net positive products do detailed calculations to understand a product’s full environmental impact. They take into account materials used, energy consumed, emissions caused, a product’s social impact, packaging, and transportation. We as consumers have the power of net positive consumption when we shop: We can buy a normal product that decreases natural resources; buy nothing and natural resources stay the same; or buy a net positive product and natural resources increase. To better understand how companies can commit to a net positive effect, let’s look at the company, Tales by Trees, a net positive art and design startup. The Finnish company aims to be a model for how to achieve both a product line and a business model that is completely net positive. The company makes data available for each and every product it develops to both the general public and the environmental science community. With each introduction, Tales by Trees hopes to give its customers an opportunity to combat climate change and biodiversity loss with simple, but impactful designs.